I’m back in Cannes after a long weekend in Lyon – the last group trip! We left on Thursday morning and stayed until Sunday morning. Lyon is the 3rd biggest city in France, but it’s not so touristy – it’s the place to go and eat! It’s the gastronomic capital of France – chefs are more famous than athletes. Needless to say, I had a great weekend full of eating. Thursday morning, we left pretty early to catch our 8am train. The ride lasted 4 hours – which was pretty uneventful. It’s kind of annoying that we had to go through Marseille and Avignon first, because that’s heading in the opposite direction! The longest part of the ride (3 hours of it) is just getting to Avignon since it’s slower and we stop more – and only an hour from Avignon to Lyon. Silly. We went straight to our hostel – up a giant hill! I didn’t realize Lyon was so hilly. This was my first time in a hostel, and it was pretty nice – we had our own rooms that locked, so it was a bit more secure. I don’t know how I’d feel about sharing a room with strangers. After settling in, we had a walking tour through Vieux Lyon (old Lyon). The tour was okay – our guide showed us a ton of old buildings from the 15th and 16th century…most of the buildings in Vieux Lyon are from that time period. Amazing that people still live in them today! Vieux Lyon also has something called traboules – passageways through the buildings from one street to the other – that are only in Lyon! If you were to go to Paris or anywhere else and say you went through the traboules, they wouldn’t know what your were talking about. 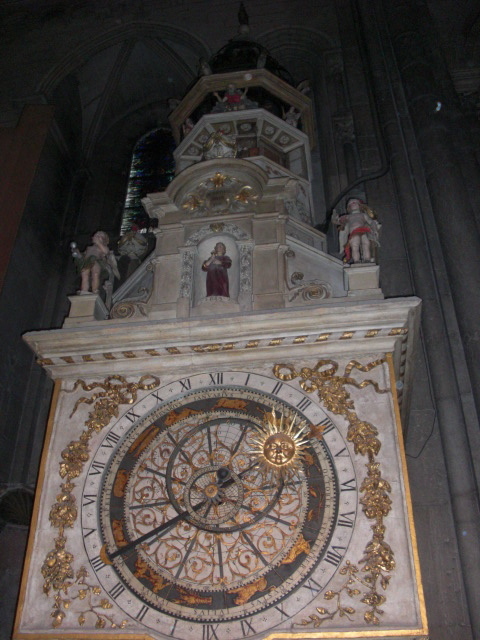 Our guide also showed us an astronomical clock inside the church there – it’s a very precise clock that tells you the day and month as well as the time. When it chimes, the mechanical beings come to life – a rooster on top crows and flaps its wings, the angel Gabriel appears to Mary for the annunciation, God begins to wave his arms, angels ring bells, and a smaller angel conducts all of it – all in a span of about 30 seconds! I like the tour, but I was feeling really tired, like I could just collapse asleep right then. Luckily, it wasn’t too long and I got a nap in before we went to dinner. On Friday morning, we went as a group to the Centre d’Histoire de la Resistance et de la Deportation – Historical Center of the Resistance and the Deportation. Lyon was a huge center of the Resistance in WWII – it was an okay museum, but not the best well laid out, in my opinion. There were lots of documents and some videos, and it was very sobering. There were a lot of pictures and videos of prisoners in the concentration/death camps – so sad! The visit definitely left me in a somber mood – how do things like this happen? How does anyone allow them to happen? How did no one step in and say – this cannot happen? I don’t know. It’s just disgusting. Afterward, we went and had a really great lunch at a restaurant in Vieux Lyon. It was another great meal – and red wine was included! Sweet. I got the pâté for my entrée – which wasn’t the best idea, but I wanted to try it. Pâté is ground and pressed meat and fat served in slices, cold. Often, it’s liver…and I am not a fan of liver, even though I’ve tried it several times. So that was a bit disappointing, since the other option was these fritter fish things that were really good. But my plat was delicious – some of the best steak I have ever had, and I had île flottant for dessert – floating islands of meringue in a cream sauce – yum! 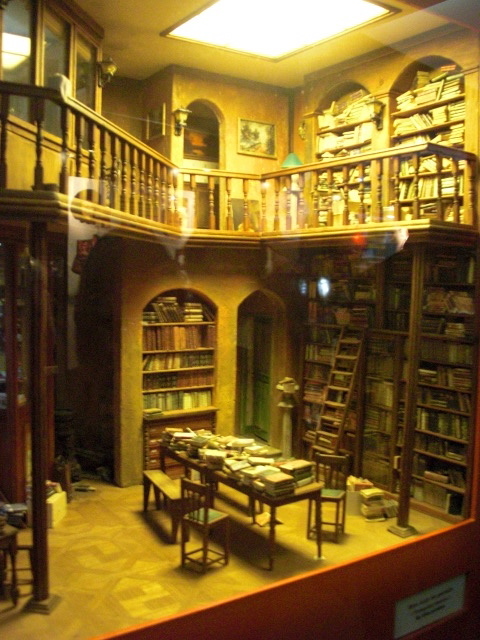 Afterward, we had some free time, and I really wanted to see the miniatures and cinema museum. The cinema part was first, and it was really cool! There were some sets from the movie The Perfume, which I haven’t seen, so it was cool but would have been cooler if I had seen the movie. There was a bunch of other stuff – all originals, not copies! – including the mask from V for Vendetta, Indiana Jones’ hat and whip (! 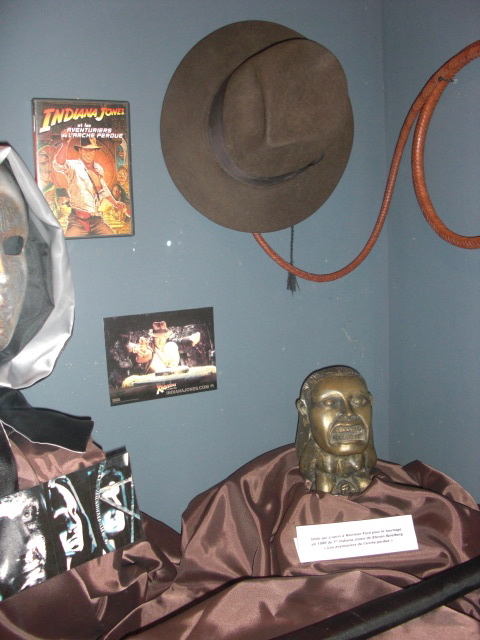 ), a couple things from Star Wars, some of the masks used in The Mummy – it was cool! And they had a good video of how miniatures are used in movies, like a miniature of the white house used in Independence Day for the explosion, miniatures of the Titanic for various parts of the filming – it was neat, and I guess I never realized how often they are used in movies. The miniatures part of the museum was also really cool to see – all the work is so detailed, it’s amazing! Tiny cafes, sitting rooms, theaters, a paleontology museum, a jail – so cool! And at the end, you could see the artist’s workshop (look through the window at it) and the artist, Dan Ohlmann, was there! Cool that he was actually there – he’s one of the best miniature artists in the world. I thought it was a great museum, and it was nice to mix it up a little bit – not another history museum, ya know? Afterward, we just went back to the hotel to rest for a while, and I spent about 2 hours updating my journal. You never think that journaling will take that long, but it totally does! And I was just a week behind – lesson learned: if you’re going to journal while you’re abroad, make sure you keep up on it. Or be prepared to spend a lot of time catching it up! 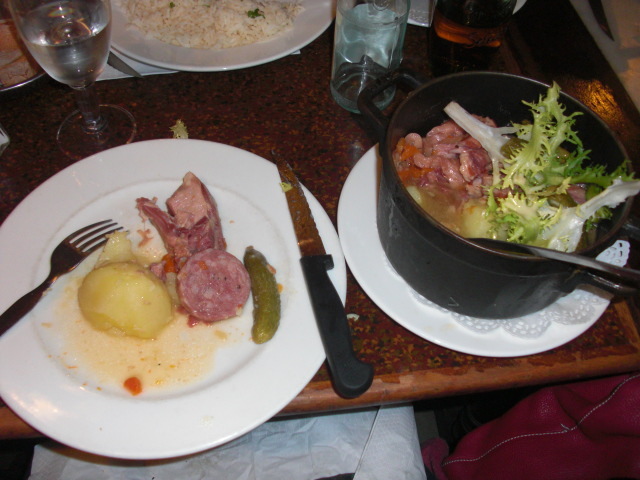 Dinner was on our own that night – I went with Leah and Laura, just walked down Vieux Lyon and found a place that wasn’t all liver and intestines and pigs feet. 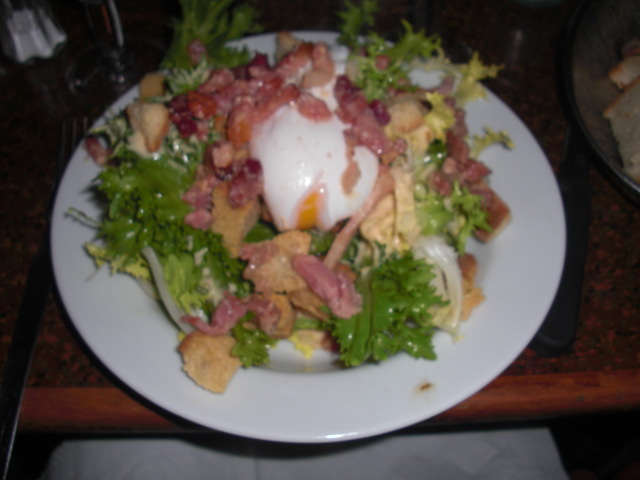 I had another salade lyonnaise (tons of bacon and a poached egg on top), some chicken, and mousse au chocolat – all good! This was the first time though that a waiter brought our check to us without having us ask first – and I was mildly offended. We were ready to go by then, and were going to ask for the check anyway, but still! Leah and Laura decided to go out after, but I really wasn’t in the mood for going out, and I kind of needed to save my money anyway, since I have 2 more trips coming up. restaurants right alongside the market stalls. I like Beth, and it was nice to spend a little time with her and get a break from everyone else in the group. Besides, I’m sure she likes to have some company since she spends a lot of time on her own on our group trips. We found a place that was soup and quenelles (fried little deliciousness – usually have meat in them, but taste more like potatoes or dough), and we sat and talked about France and India. And it was really nice! We split up then, and I headed to the Lumière museum since I was already halfway there – it’s a museum about the 2 brothers who invented Cinema. It was in the house they used to live in – gorgeous Victorian mansion – and it was a pretty good exhibit. All the explanations were in French, which isn’t a problem, but it takes more effort then. I just passed through and spent a little time in the park/garden there (and some lady asked me for directions – I love when people do that! Means they think I’m not a clueless tourist and that I actually speak good enough French!) and then metro-ed it back to the hostel to rest before dinner. Leah was feeling a bit better then, which was encouraging, and found the movie He’s Just Not That Into You online so we watched that and I got to doze a little. 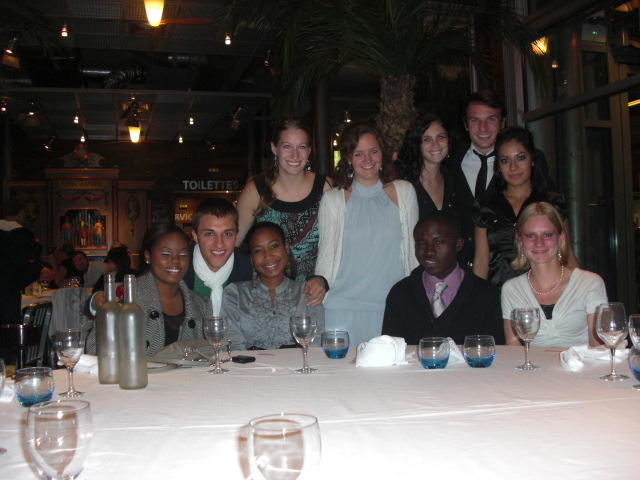 We actually got to dress up for dinner – Beth was taking us out to a nice dinner! We each get 35 euros from our student activity fee to spend, but we all have to do the same thing, so we voted to have a nice dinner out. We went to L’Ouest, one of 4 brasseries of Paul Bocuse, one of the most famous chefs in France. It was all really good food – I had cesar salade, (which was like a meal in itself – but i had worked up my appetite so i wouldn’t waste any food! ), salmon, and fruit salad for dinner – all sooo good! We spent 3.5 hours at dinner and didn’t feel rushed or that it was going to slowly – one of the many things I love about France! We took the bus back, but the bus we wanted didn’t come…we thought it might be late but it didn’t come at all! We had to wait for 40 minutes for the next one, and didn’t get back until after midnight. Sunday was basically just traveling – our train left at 11:07 so we had to be there around 10. I had a little panic attack when I couldn’t find my tickets, so I was really relieved when I found them! The train ride back was uneventful – I always hate traveling back, I just want to skip over the traveling and be back already. We got back around 3:30, and I had a lot to do. I sat down and wrote my next LG story right away (about dining out in France) and then started some other hw before dinner. After dinner, I got to talk to Karl for 2 hours!! It was fabulous. And now, back to the grind – lots of class and theater. 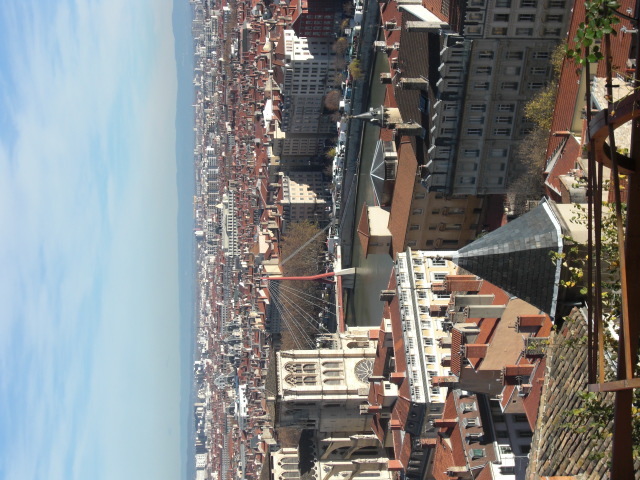 I was glad that Lyon didn’t have as much to see there – I really needed to relax a bit. I’ve been on the go nonstop for the past 5-6 weeks; busy traveling and covering as much ground as possible on the weekends and lots of class and theater during the days I’m back at the Collège. The last few trips I only had 3 days to prepare – basicaly just enough time to do laundry and repack! So, I was okay with taking some down time in Lyon. I’ll be back in Paris this weekend and I’m super excited! I LOVE PARIS. It’s sad that this will be my last time there for a really long time – who knows when I’ll be back…but I’ll be meeting Kate Lutz there! It will be great to catch up with her, and show her a little part of France!